Ann Arbor Derby Dimes and ARBCO present the 3rd annual Ultimate Woman's Arm Wrestling Tournament! 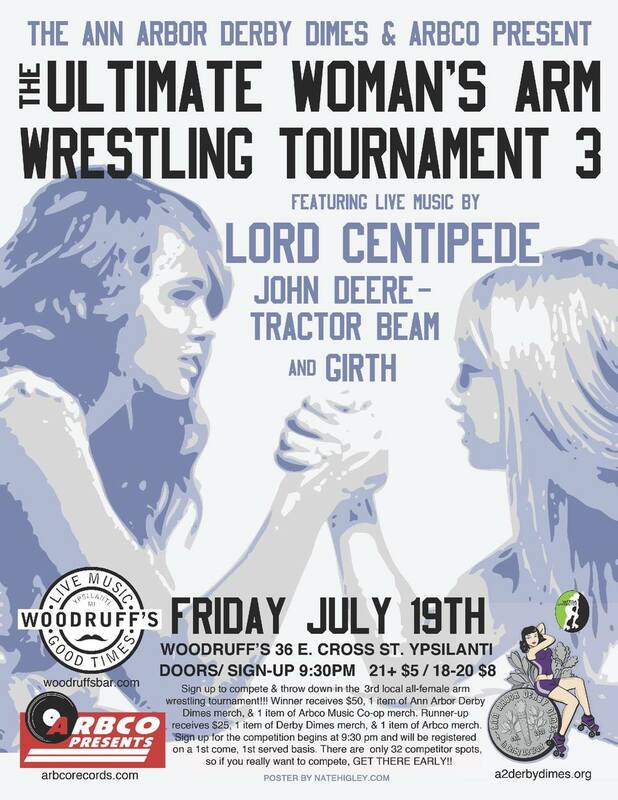 Live Music by: Lord Centipede, John Deere-Tractor Beam and Girth! Join us to throw down in the third local all-female arm wrestling tournament! -Winner receives $50, one item of A2D2 merch, & one item of Arbco merch. -Runner-up receives $25, one item of A2D2 merch, & one item of Arbco merch. Sign up begins at 9:30pm. 32 competitor spots are available. If you want to compete, GET THERE EARLY!